I have a lot of people contact me and ask which is a better gun cleaner, M-Pro 7 or Breakfree CLP? 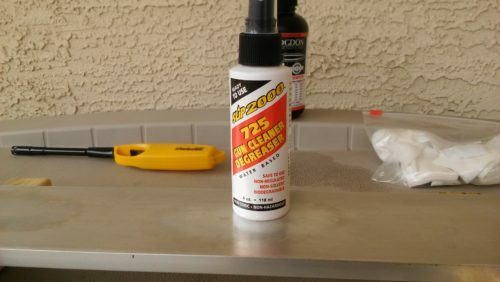 Based on my experience with cleaning many guns and performing gun cleaner tests in the past 2 or 3 years….M-Pro 7 gun cleaner is much better at cleaning a fouled firearm. M-Pro 7 gun cleaner is water based and really soaks into carbon fouling, making it very easy to remove. 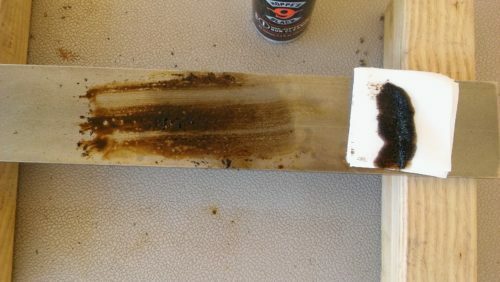 In my gun cleaner tests, I sprayed M-Pro 7 gun cleaner on a pile of carbon/powder fouling and let it soak for 10 minutes. I then took a single patch and wiped the carbon/fouling off. Nothing could be easier. I did the exact same test with Breakfree CLP and the carbon did not wipe off. It required scrubbing in order to remove the carbon and a lot of scrubbing. Breakfree CLP is an excellent lubricant and protectant but not a very good cleaner. So which gun product cleans better…Cleaners or CLP’s?? Let’s test them to see which product cleans more effectively. 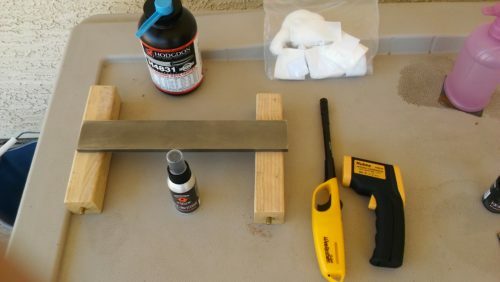 I use a simple gun cleaner test consisting of a flat steel bar, smokeless powder, cleaning patches and a gun cleaner or CLP. 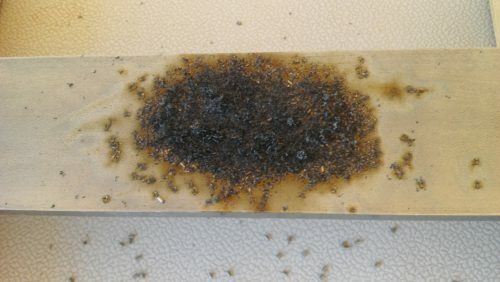 I burn 2 or 3 charges of smokeless powder on the steel bar and then apply a gun cleaner or CLP to the fouling. 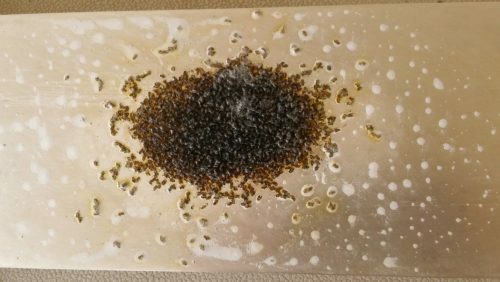 I let it soak for 10 minutes. After the 10 minute soak, I take several cleaning patches and wipe the area clean or at least attempt to. Now let’s watch a straight gun cleaner at work – Mil Comm MC25 Gun Cleaner. So how well does Hoppe’s GunMedic Cleaner and Lube work? The only way to really know the truth is to test it scientifically. If you watch someone clean a gun or barrel with a gun cleaner, can you really determine if the cleaner works well? NOT REALLY. 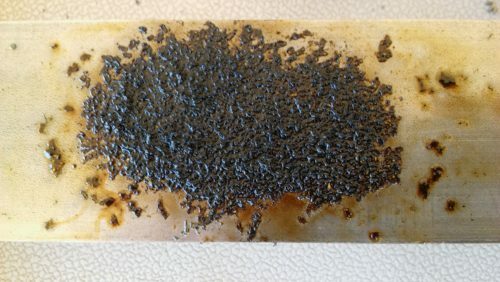 I do scientific tests when it comes to gun cleaners and gun oils. 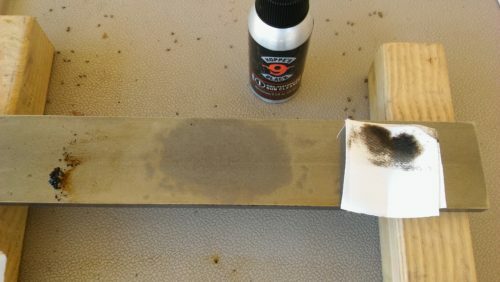 For gun cleaners, I burn some powder on a piece of metal and then clean it with a gun cleaner. You are able to see how well it works because everything is in the open unlike the bore of a gun barrel. It will either wipe clean easily or it won’t. Here’s my Hoppe’s GunMedic Cleaner and Lube test video. 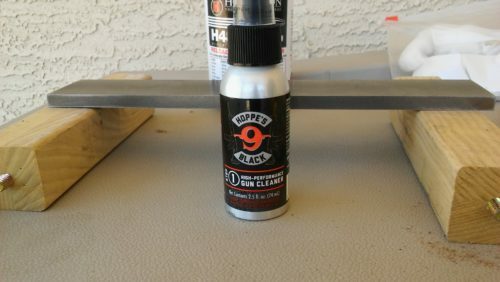 Hoppe’s latest gun cleaner is the No 9 Black High Performance Gun Cleaner. So how well does this new fangled gun cleaner work? 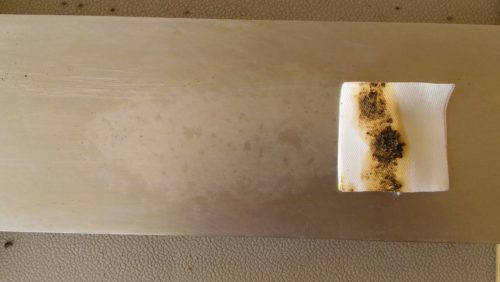 I use a simple gun cleaner test composing of a metal bar, smokeless powder, gun cleaner and some cleaning patches. 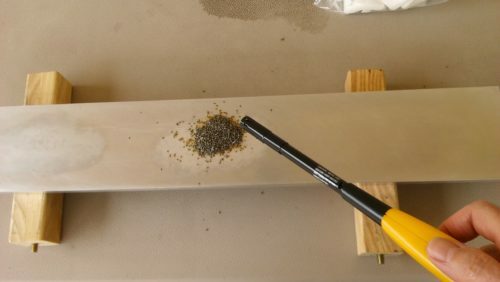 First I’ll clean the steel bar thoroughly before burning the powder on it. 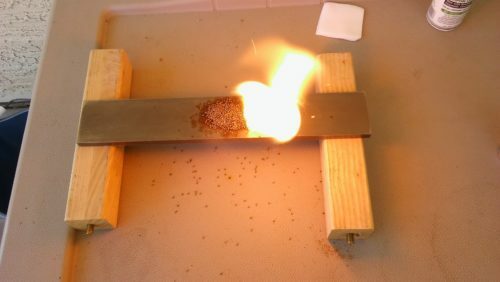 After cleaning the bar, I add about 40 grains of H4831 smokeless powder to the steel bar and then ignite it. I repeat this 3 times to make sure there is a good amount of fouling/carbon buildup. Then I’ll attempt to clean it. Here’s the first powder charge. Here’s the 3rd powder burn – the flame temperature is over 850 degrees F.
This is the result of 3 powder burns. There is a lot of carbon and other powder residue. Now I’ll spray a liberal amount of Hoppe’s No 9 Black High Performance Gun Cleaner on it and let it soak for 10 minutes. Notice how much gun cleaner is on the fouling. 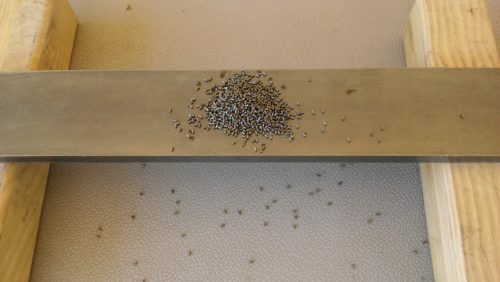 Don’t scrimp on gun cleaner application. More will soak better and make cleaning easier. Enough gun cleaner has to be applied so that it can penetrate through all of the fouling to the bare metal. This is a closeup after the 10 minute soak. 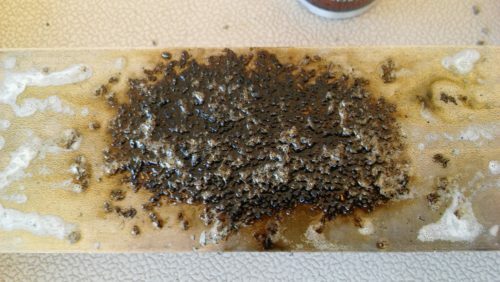 The Hoppe’s Black Gun Cleaner has penetrated all of the fouling. See how wet it still looks? Here’s the first wipe. The carbon is removed easily…no scrubbing. Let’s do another wipe. Does Hoppe’s No 9 Black HP Gun Cleaner work well? You bet!!! Clean Guns While Still Warm or Hot? 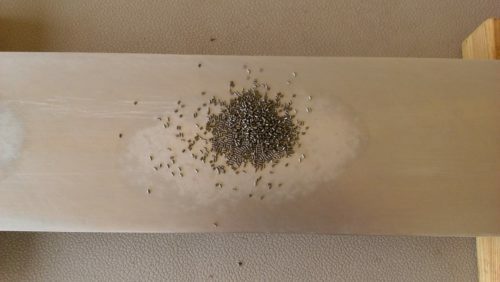 Should you clean your guns while they are still warm/hot from shooting? 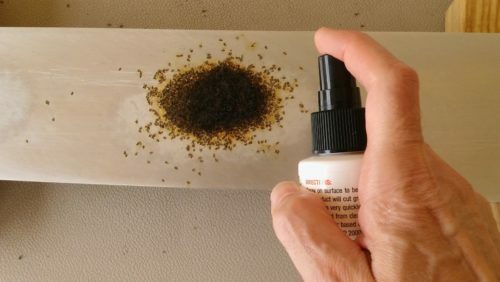 While fouling may be easier to remove when guns are warm or hot, the higher temperature may cause your gun cleaner to evaporate before it has a chance to soak into the fouling/carbon. Gun cleaner soak/penetration is much more important in gun cleaning. If the gun cleaner does not penetrate the layers of carbon and powder residue, it will not remove it. The ideal gun cleaning scenario is to submerge the barrel and action in gun cleaner at a temperature of about 90-95 degrees for an extended period of time(hours). 2 critical aspects of gun cleaning will make or break it. Use a gun cleaner that is water based or with a low viscosity(not oil or alcohol or acetone based). Soak time of 10 minutes, while wet. Slip2000 725 Gun Cleaner is a non-toxic water-based cleaner and degreaser. I have used it in the past on my Glocks and it worked really well but I never really new how well, so I decided to test it. I use a simple test for gun cleaners. It’s composed of a metal plate or bar, smokeless powder and a gun cleaner. 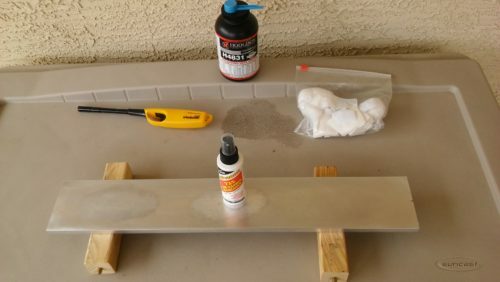 I burn several charges of gun powder on top of the metal plate and then apply a gun cleaner to see how well it removes the fouling and residue. Let’s take a look at the gun cleaner test setup. Here’s the typical gun cleaner test setup/equipment. The first thing I do is clean the test bed which is the aluminum plate/bar. 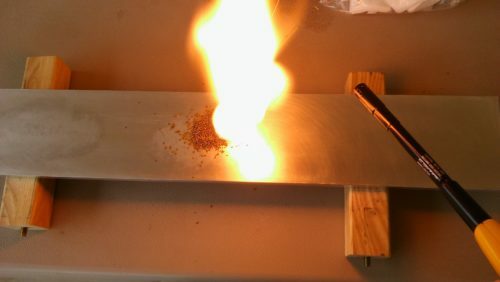 Then I pour a 50 grain charge of H4831 smokeless powder on top and ignite it. 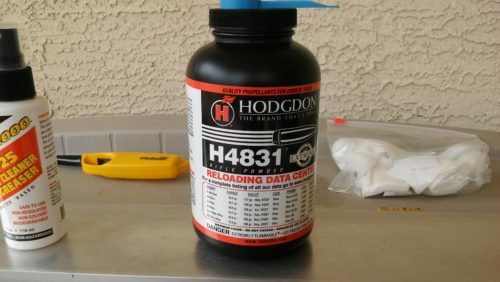 Hodgdon’s H4831 is a slow burning powder, so it’s pretty safe to experiment with. Here’s the 1st powder charge. I’ll ignite this one and then do it all over again 2 more times. This provides a good amount of fouling that is pretty hard to remove easily. 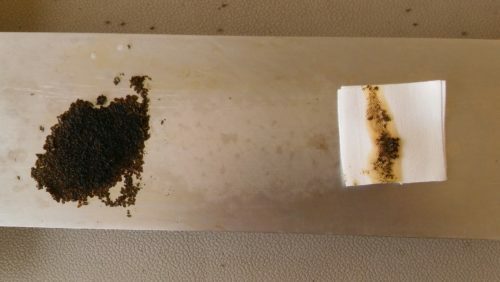 I use a long grill type lighter to ignite the powder. You can see how slow this powder burns. It takes about 3 seconds to burn. Here’s the result of 3 charges of H4831. 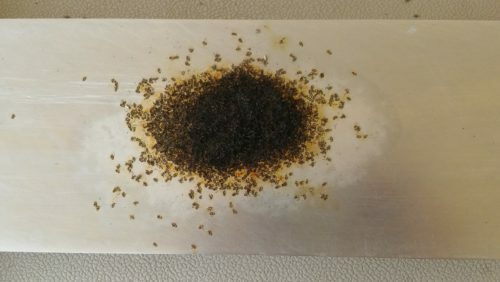 There’s a pile of carbon that is stuck to the metal test media. Let’s see how well Slip2000 725 gun cleaner removes this. I’m applying the 725 gun cleaner to the fouling, spraying it on very heavily and then letting it sit for 10 minutes. 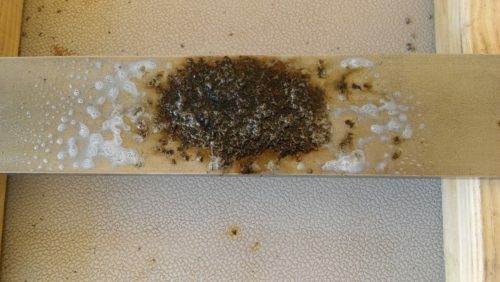 This is the key to cleaning carbon fouling. You have to let it SOAK. Here’s the fouling soaking. I’ll try wiping it clean after 10 minutes. The fouling “pushed” to the left easily when I used the cleaning patch to wipe the area. The Slip2000 725 gun cleaner loosened the fouling, so it could be wiped off easily.